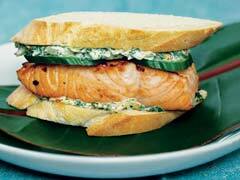 The herb-flavors in the Italian dressing makes a quick chimichurri sauce for this one-of-a-kind sandwich. Heat 2 Tbsp. of the dressing in large skillet. Add fish; cook 4 min. on each side or until fish flakes easily with fork and golden brown on both sides. Meanwhile, mix remaining 2 Tbsp. dressing, the parsley, cilantro, onions, mayo, red pepper and lime juice. Spread mayo mixture onto bread slices. Fill evenly with fish and cucumbers. Prepare as directed, using KRAFT Light Mayo Reduced Fat Mayonnaise. Use a food processor to finely chop the onions, parsley and cilantro. Chimichurri is a thick herb sauce commonly used in Argentine recipes. Oil, vinegar, parsley, oregano, onions, garlic and ground red pepper (cayenne) are ingredients typically used to make this sauce.